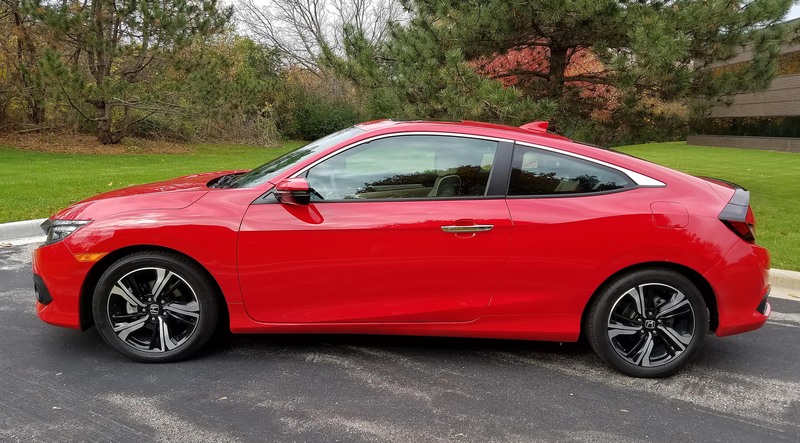 Honda’s new Civic Coupe has a sleek profile, peppy turbocharged engine and responsive handling, but it also has a few issues that reinforce it’s an entry-level car. Through the years the Civic has grown up. It has gotten larger and now rides on a 106.3-inch wheelbase. It’s no longer an econobox. 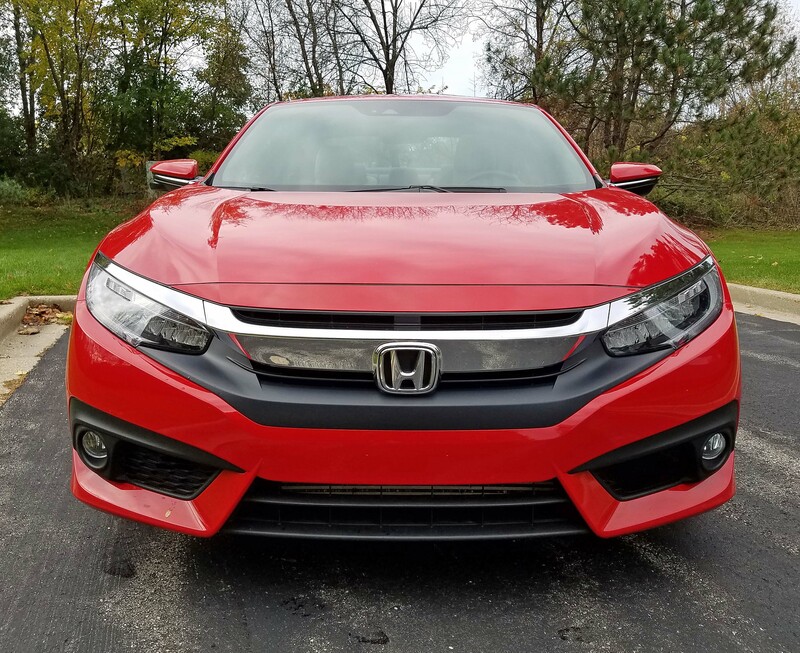 Civic also comes as a sedan, coupe and for 2017, a hatchback, with the coupe having the best overall styling. Previously I’d driven the economical sedan with base 2.0-liter 158-horse I4. It’s underpowered, so the coupe was more fun to drive with its 1.5-liter I4 turbo that creates 174 horses. It was linked to Honda’s 6-speed CVT, which is adequate, but groans quite a bit under heavy acceleration. Power though is good and could only be improved with a 6-speed manual. Handling is the car’s strong point though with quick steering that is responsive, making it fun to drive in town. Civic feels heavier than the car’s 2,888 lbs. would seem to indicate, but the Honda carves through corners well and there is no play in the wheel. You’d expect ride to be fairly smooth with this length wheelbase, and it is better than in some shorter coupes. Yet there is a bit of jiggle here that I had not felt in the sedan. The car features 17-inch tires in the bright red top-end Touring model I tested. Impressive, as always, was the Civic’s gas mileage. This was the car’s calling card and top selling point when first introduced back in the 1970s. I got an amazing 36.6 mpg this time, in about an even mix of city and highway driving. I’d gotten 30.8 mpg in the sedan earlier in the year. The EPA rates the car at 28 mpg city and 40 mpg highway. Less impressive was the noise level in Civic’s interior. I’d found the sedan relatively quiet, but road and tire noise was higher here and made conversation difficult when driving on the highway. The test car’s interior looked good though with tan and black leather seats and door trim coupled with a black dash and satin silver trim on the dash, doors and by the console-mounted shifter. Main gauges are simple to see and attractive and there’s a manual tilt/telescope steering wheel. However, adjusting the wheel is difficult because the reach to release it is extremely deep on the steering column. Buttons on the hub for radio, computer etc. also are quite small and easy to bump the wrong ones. Seats are manually adjusted too, but are well formed with good back and hip support, adding to the coupe’s sporty feel. Front seats have three levels of heating too. Rear seats are cramped as in most coupes, so this is primarily a car for two. Aside from the interior’s noise level though its main drawback remains the radio. I didn’t like the sedan’s and this is equally clumsy. I could tune in local stations this time, but adjusting the radio on the 7-inch touchscreen is not simple while driving. Remember that for 3-5 months a year us Wisconsinites are wearing gloves, so buttons work better than touchscreens. Cargo room is moderate behind the rear seat, which does split and lower though. And while this looks similar to a hatchback it is not. However, for the first time in 20 years, Civic is available as a hatchback for 2017. 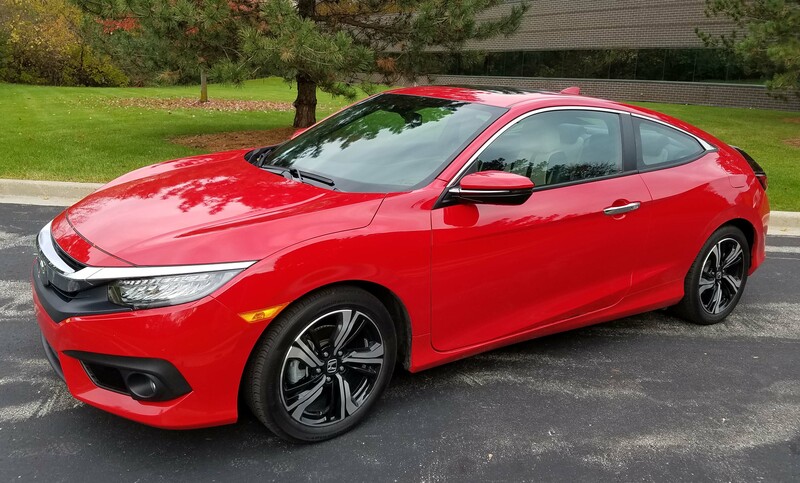 The tested Touring model comes with a sunroof though and also is loaded with electronic goodies, such as a navigation system, LED headlights, 450-watt premium audio system and Honda Sensing. The sensing package includes adaptive cruise control, road departure mitigation, forward collision warning, lane-keeping assist and collision mitigation braking to help avoid major collisions. 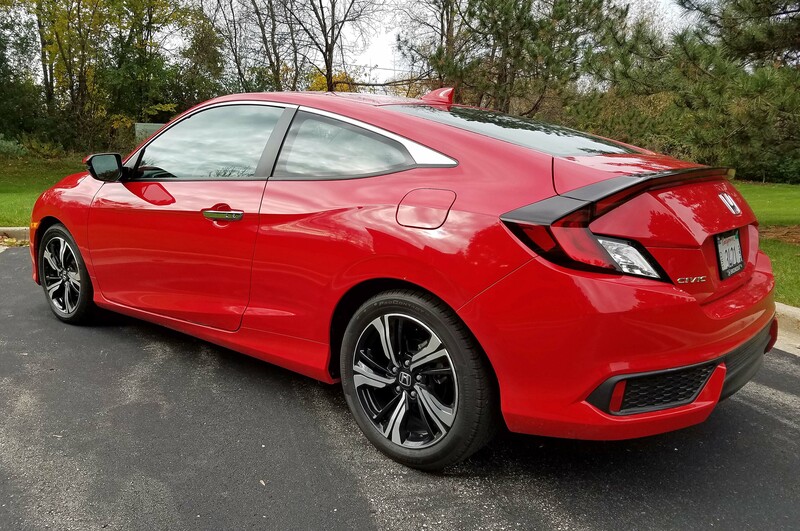 Honda Sensing is a $1,000 option on lower line models, but standard on the Touring model, which lists at $27,060, and that includes delivery. So with no options the test car remained at the sticker price. Yet more economical models abound in the Civic lineup. The base LX sedan starts at $19,575, the coupe lists at $19,985 and hatchback at $20,535. There are five trim levels and each comes with additional features. Automatic climate controls, a rearview camera, USB port, Bluetooth connectivity and fog lights are standard on the LX, as is a smaller 5-inch touchscreen. 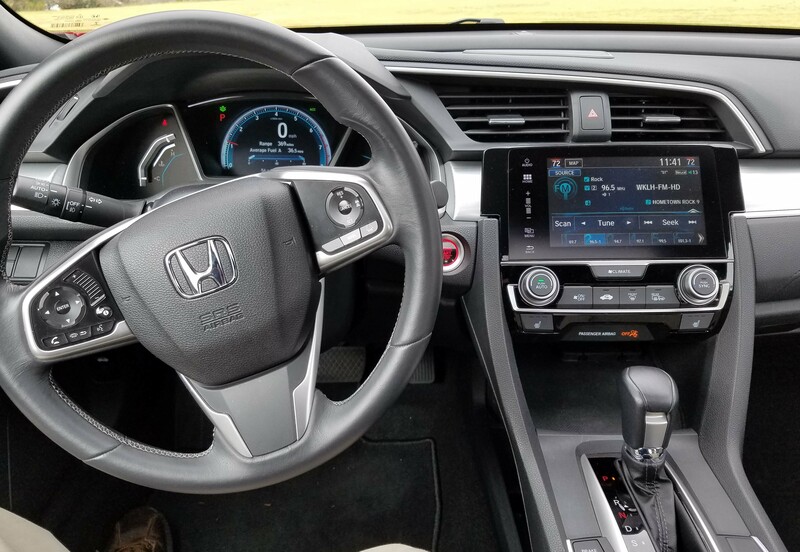 The EX adds automatic transmission, remote start, a moonroof and the 7-inch screen, plus Apple CarPlay and Android Auto compatibility. Moving up to the EX-L adds leather seats and the EX-T is the first trim to offer the turbocharged engine. Most of us would prefer the extra power, especially since this engine also gets slightly better gas mileage. For the record, the sedan has a larger cargo area, 15.1 cubic feet vs. 11.9 in the coupe. The hatchback offers 25.7 cubic feet of hauling capacity, even more when the rear seats are lowered. For those shopping the entry level, this competes well with the Toyota Corolla, VW Jetta, Mazda3, Chevy Cruze and Kia Forte. The Jetta and Mazda3 are the best handlers, but this is close behind and has the top gas mileage rating. If you prefer AWD, Subaru’s Impreza is your best bet, and a new one of those has just been launched. 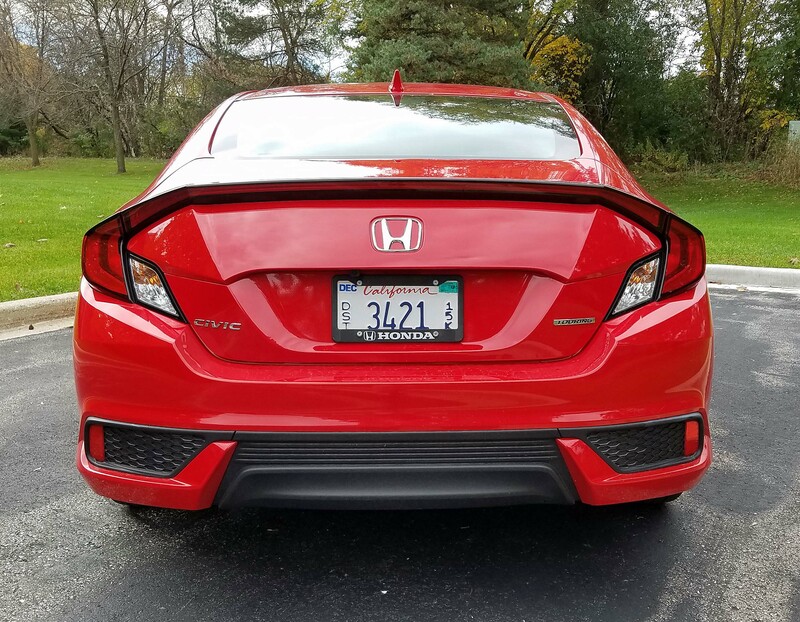 Note too that if performance is your primary concern in a coupe, that Honda plans a Civic Si and Type R models in the next year or so too. Hits: Responsive handling, great mpg and sporty profile. 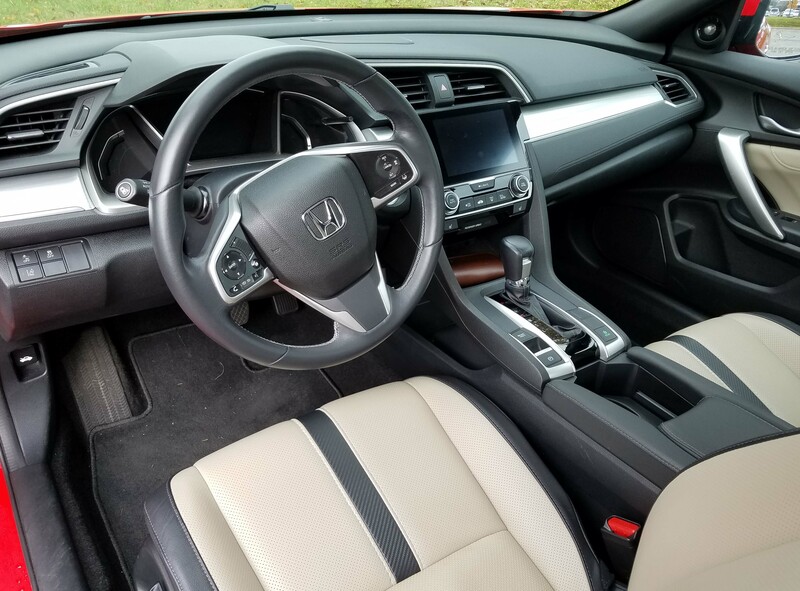 Comfy sporty interior with supportive heated seats, sun roof and backup camera. Misses: Noisy interior and cramped back seat, clumsy radio touchscreen, somewhat jiggly ride and powertrain groan. Also while it looks like a hatchback, it isn’t.